The crepe is not a recent invention. 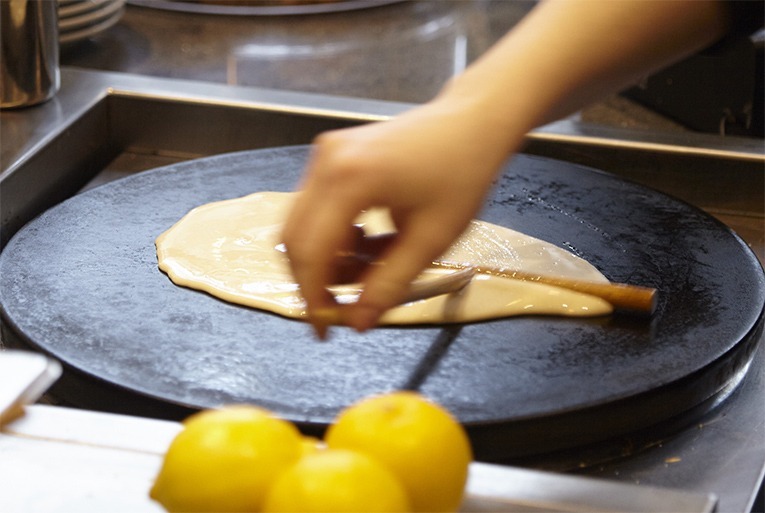 Following diverse research, historians have shown that crêpes were created 7,000 years BC! At the time it looked more like a big, thick pancake. This pancake was a sort of doughy mixture using different crushed cereals mixed with water. Frying pans did not exist during this period, so very hot flat stone was used early on. The crêpe or buckwheat galette was first introduced in Europe (in Brittany, France) from the 13th Century – following the start of the buckwheat culture, brought to us from the Asian crusades. The first crepes were made only with Buckwheat flour and then later on with wheat flour, which is the popular recipe we know and love today! Many people still flip their first crêpe with their right hand whilst holding a gold coin on the left hand, as it is supposed to bring prosperity. Other people used to throw their first crêpe above a chest of drawers, again as a superstitious act.